The shortlist for the 2011 Miles Franklin Literary Award, which included Kim Scott’s That Deadman Dance, was controversial because it consisted of only three novels, all written by men. The exclusion of women writers for that year itself was noteworthy: for example, Fiona McGregor’s fine novel of Sydney, Indelible Ink (Scribe), did not even appear on the longlist. The 2011 shortlist served also to emphasise the historical male dominance of the Miles Franklin Literary Award. Nonetheless, Scott’s That Deadman Dance, a novel about early contact between indigenous and non-indigenous people in Western Australia, was a worthy and widely anticipated winner. And as Scott noted, indigenous writers are also under-represented in the history of the Miles Franklin Literary Award. Apart from Scott himself, whose earlier novel Benang shared the 2000 award with Thea Astley’s Drylands, Alexis Wright won in 2007 for Carpentaria. An academic as well as a writer, Scott’s publishing history demonstrates a singular and thoughtful approach to discussions about indigenous culture, including language reclamation. Apart from fiction, his published works include Kayang & Me (2005), a memoir co-written with his elder Hazel Brown, in which Brown’s stories and Scott’s probing discussion commingle. He has also co-authored books for children as part of the Wirlomin Noongar Language and Stories Project. The reflective care that Scott brings to these tasks is also evident in the way he describes himself. For example, his biography on the Miles Franklin Literary Award website reads, ‘Kim Scott’s ancestral Noongar country is the south-east coast of Western Australia between Gairdner River and Cape Arid. His cultural Elders use the term Wirlomin to refer to their clan, and the Norman Tindale nomenclature identifies people of this area as Wudjari/Koreng.’ On the website of Curtin University, where Scott works, he is, ‘A descendant of people living along the south coast of Western Australia prior to colonisation and proud to be one among those who call themselves Noongar.’ In engaging so carefully with questions of identity, language, and culture, Scott challenges the rest of us to take these matters seriously. It is symptomatic of his writing, which is open-armed but precise and challenging. Cross forms a special and abiding friendship with Wunyeran, Bobby’s uncle; one time, in a stunning scene, they sing to each other, finding a way to extend their communication. Upon Wunyeran’s death, Cross is sufficiently overcome with grief as to pray to God to admit Wunyeran into heaven, ‘despite the many – not knowing him – who would say heathen and insist he was but an uncultivated savage’. On the one hand, this seems a moving and generous act – and yes, an act that suggests something approaching equality. On the other hand, it imposes a presumptuous world view. When Cross’s assistant mishandles Wunyeran’s body according to Noongar customs, there is an excruciating tenderness about Cross’s efforts to make amends. But while his desire to right a wrong resonates, so too – ultimately more so – does the futility of the effort. In Scott’s hands, this climax – this solution that is no solution at all – becomes a riveting, vibrant synthesis of the novel’s themes. Not least, it reinforces that culture and resistance endures and adapts, but also that acts of dispossession and appropriation occurred – and occur – slowly, not in some fantastic moment of first contact. And yet there are moments that go beyond exchange for mutual need, or expediency, and that are genuinely affectionate – times when the expression ‘the friendly frontier’ seems to make some sense. Ultimately, though, this complexity makes the bigger story even hard to bear. Birch, Carol. 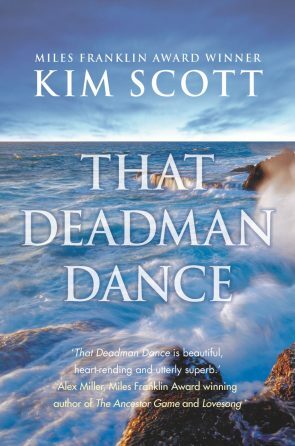 ‘That Deadman Dance by Kim Scott – review’. The Guardian, 8 December 2012. Fraser, Morag. ‘That Deadman Dance’. Sydney Morning Herald, 13 January 2011. ‘Kim Scott wins prestigious Miles Franklin’, ABC News, 22 June 2011. Scott, Kim. Benang: from the heart. Fremantle Arts Centre Press, 1999. Scott, Kim. That Deadman Dance. Picador, 2010.